Sunday’s opener against the Minnesota Vikings will tell us so much about the Detroit Lions. They didn’t reveal much in the preseason due in part to injuries and also because they didn’t want to give away much. Coach Jim Schwartz just operates that way. 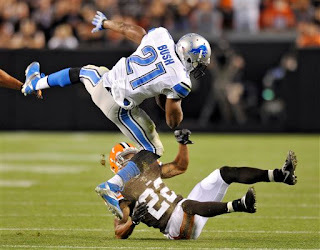 With several key new players including Reggie Bush on offense and Glover Quin on defense, this game will give us a better idea of what we will see in the next 15 games. Of course not if you ask Schwartz. “It’s one of 16. It’s just life in the NFL. All of them are important,’’ Schwartz said Friday. “Look at Baltimore right now. Won the Super Bowl last year. It’s easy to overreact with a win, whether it was Denver (Thursday) night, or overreact with a loss. That’s just the way this league is and the scrutiny that goes along with it. You have to be resilient in this league. You have to persevere. “We need to keep in mind it’s 16 games. Certainly a win would help us. It’s a division game. It’s a home game. Those are two real important reasons right there. We want to get off to a good start. We’ll do our very best to do it,’’ Schwartz said. With all that said, it’s time for predictions. I’ve been there through the draft, free agency, OTAs, minicamps, training camp and the preseason games. I’ve talked to players, coaches and coordinators and compiled all the information to arrive at my predicted win-loss record. The Lions, coming off a 4-12 season, will finish 9-7, probably one win short of making the playoffs. Their wins will be: Vikings (Sunday), at Arizona (Sept. 15), Chicago (Sept. 29), at Cleveland (Oct. 13), Cincinnati (Oct. 20), Tampa Bay (Nov. 24), Packers (Nov. 29), at Eagles (Dec. 8), at Giants (Dec. 22). The final game of the season could mean a ticket to the playoffs or not. That will be at the Minnesota Vikings. Who knows what will happen to both teams by that point, but right now I see the Vikings winning that one. However, Sunday’s game at Ford Field will be different: Detroit 35, Vikings 24.